At TRINITY BAPTIST CHURCH we are working to meet this challenge given by Christ. We believe that children grow to be happy, well-adjusted adults only through a personal relationship with Jesus Christ. In seeking to accomplish this task our children's teachers work hard at providing a warm, friendly, growing atmosphere. TRINITY provides Christian learning activities like Sunday School, Children's Worship, Vacation Bible School and TeamKid. Our Preschool Ministry is a very important part of our work here at Trinity Baptist Church. Our goal is to give our children happy and positive experiences as we teach them about the Lord Jesus Christ. 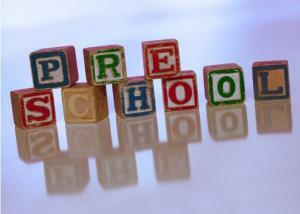 We provide learning experiences for children starting with newborns to those completing kindergarten. We not only have new and up-to -date facilities in our "T" Center, we also have an outdoor, fenced-in play area adjoining their classrooms. We would like to invite you to come and view our facilities, meet your Preschool workers and allow us the joy of teaching and caring for your preschooler as you enjoy Bible Study and Worship with our church family at TRINITY.